I read this article and found it very interesting, thought it might be something for you. 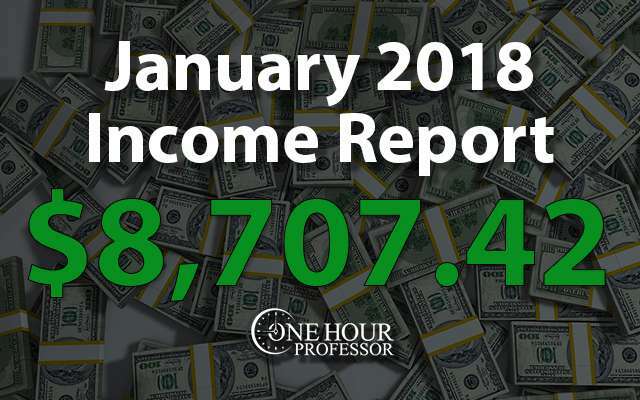 The article is called January 2018 Monthly Income Report and is located at http://www.onehourprofessor.com/january-2018-monthly-income-report/. I’d be lying if I didn’t say that I was really happy at how this year has started. Although I didn’t hit my goal of $10,000/month in revenue goal for 2017, it’s cool that I was able to nail that goal in the first month of 2018. This was my second-best month ever since I’ve been running my online business. More importantly, I think the cool part about this is that I didn’t have a website go viral or any sort of fluke, it was just my portfolio of websites doing really well and combining for a large amount of income. Probably the biggest surprise of this month was the performance of the CK website. I’ll get into more detail in the report itself, but this website was able to make almost $500 for the month and that’s pretty impressive considering I’m only monetizing with Google Adsense. One new metric I’m going to include in the beginning of all of my monthly income reports is average earnings per day. I feel like this will be a good way moving forward to correctly measure months against each other because some months are shorter than others. OHP Affiliate Income: I think that the biggest surprise that I saw this month was how well one of my affiliates was performing on the One Hour Professor website called Ninja Outreach. Typically, the OHP website doesn’t make that much money, but this month it picked up over hundred dollars from this affiliate that I’ve rank in Google for years. Because of this, I’m going to end up going into the review and updating it to make it even better. BCC Affiliate Income: The affiliate income on this website was also a really big surprise as I was able to surpass the affiliate income that I made in December. Because this website is an Amazon Associates affiliate, usually the biggest month the year is December, but I’m really happy to see that January was able to beat that. JFFHUB Media.net Ad Revenue: The ad revenue for JFFHUB in the month of January was really good and while I’m not sure that this is the new standard, it was quite an increase that I was very happy to achieve. I think part of it is just seasonal and people trying to find a job in January, but we’ll see what February has in store. Overall Adsense Revenue: Lastly, I have to mention how great it was to see Adsense earnings increase across my entire portfolio of websites. I’m sure some of this had to do with advertisers spending in January, but I am also confident that a big part of it is that I did some ad testing and found that the text link ad unit on Google Adsense ended up paying more than double what other clicks were on both the CK and BCC websites. This was a big win for me as it effectively doubled the income that I got from each of them. I think one of my bigger accomplishments this month is that I actually don’t have any expense outliers. I really stuck my budget and didn’t purchase any erroneous items, which is reflected on my bottom line. JFFHUB Update: I don’t have a whole lot to talk about in terms of what I did for this website in January. All in all, I focused mostly on trying to outrank one of my competitors on a core keyword in the search engines. To accomplish this, I rebuilt one of my databases around reentry programs and used that to complete some additional link building opportunities. This link building was focused on getting links for a specific page and I was able to get six links directly to that page. While I’m not 100% sure how much this is going to move the needle, it definitely doesn’t hurt. Consulting Update: No consulting agreements for the month. If you’re interested in my consulting services, shoot me an email. Note: My consulting is currently $150 USD/hr. 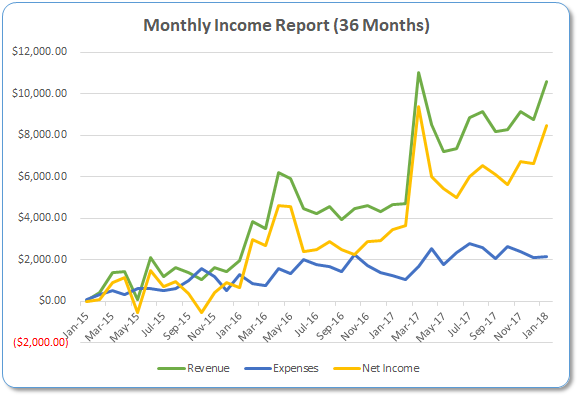 Udemy Update: My income from this channel did increase a little bit in January which was nice, but as I mentioned in previous income reports, this is no longer a focus of mine. While I’m happy to accept the income every month that comes in passively through this channel, I have no intention of creating any additional courses at this time. OHP Website Update: For the first time in a long time, I actually wrote another post on the OHP website. But I wouldn’t say it was just a blog post, it was a really in-depth review about Thrive architect, which is the page builder that I use to create all of my websites. All in all, this review took me about 15 hours to create and if you haven’t seen it yet, I highly recommend that you check it out here. This is a great WordPress plug-in for those of you who are like me and don’t know how to code. Basically, this tool lets you use point-and-click functionality to create a beautiful looking website. If you’re wondering, the entire website design of One Hour Professor was created using Thrive architect. Oh, and by the way, if you want my free course about building an authority website of your own, you can get it here. JFTHQ Website Update: A few months back I mentioned how I was just going to continue link building to this website because I didn’t know how else to make it better. Honestly, I’ve spent a lot of time and money tying the content together on this website and giving visitors a great experience, I’m out of additional ideas. As reported in my last income report, for some reason this website was penalized in December and although I wanted to give up, I decided that it would just be better that I continue link building to see if it would help. To be honest, I couldn’t be happier with the results. In January we were able to get 15 new links to the website and more importantly, this is the most page views I’ve ever seen on this website in a given month. While the organic traffic is still lagging a little bit behind from its peak, the redesign of the site structure and content refresh done a few months back has increase the amount of page views that happen on the website and the organic traffic is starting to rebound. At this point, I have over 8000 more link targets that I’m going after and I assume for the entire year I’ll be able to continue to build links to this website. My hope is that over time, Google will continue to rank this website and eventually I’ll start ranking for some really big terms. If I’m able to rank for some of these really big terms, this website could easily surpass the earnings of JFFHUB. Right now, I have minimal ad units on the website in an effort to attract more links and I’m going to keep it that way because I’m pretty happy with these monthly earnings as the website is right now and the fact that it’s still attracting some links is a huge bonus. As you can see, there was quite an increase in referring domains. This isn’t technically correct as Google seems to always lag behind in recognizing back links, but I guess if that’s the increase that Google saw I definitely shouldn’t be complaining. Earnings increased a little bit as well which was nice. I assume this website will stay somewhere between $400-$500 per month for most of the year, unless Google gives it some love. January was the month with the most pageviews to the website ever, so that was a positive sign. I’m not really sure if that trend will continue, but I sure hope so. If I hit $1000/month with this website, it would be astonishing to me. CK Website Update: I decided in the middle of January that I was going to try to monetize the CK website. While I didn’t put too much thought into it, I figured that I should throw some Google AdSense ads on the website most visited pages to see if I could generate any revenue. Boy am I glad I did this. As you can see, the website made just under $500 for the month and I have no doubt in my mind that it will continue to do this and increase significantly moving forward. This was a huge win for me and I think one of the biggest learning points of the month. If you take nothing else away from this post, the one thing you need to do is to make sure that you test the Google Adsense text add link units on your website. These are the ones where people have to click on text and will be brought to another page, and then click on an ad to generate you any revenue. This doesn’t seem like it would make more money than the regular ads which people click once, but for me, in this specific niche, I found that the clicks from the text link ad units were worth more than double per click. I tested them against each other for 15 days and once I found the winner, I put the text link ad units on top of the page and a regular responsive adsense ad unit on the bottom of the page. Obviously, the strategy is paying off for me, so if you’re reading this and have never tested those before, now is a good time to do it. The one thing I will say is that you want to give yourself at least ten days of data prior to making any decisions. Making this switch too early can backfire. For this website to only be six months old and generating just under $500 is an anomaly from my experience. I also mentioned last month how I wanted to make affiliate posts on this website that are far and away better than all of my competitors. The premise was that I would actually purchase the products I review, take pictures and video, and then post my experience. While I would love to purchase all of the products for all of the reviews, instead I decided that I’m only going to do this for terms that are over 1,000 searches per month. I’m doing this because anything that’s under that search volume isn’t worth the expense. My assumption is that anything with over 1000 searches per month will be worth it because…and here comes some napkin math. At a 10% conversion rate (which is what I’ve seen on the BCC website on Amazon) I’ll be able to get affiliate income for 100 of those products per month assuming I have 1000 people landing on the review page. If we assume the average cost of a product in one of these reviews is $50, that would mean at my current commission rate I can earn somewhere between $4-$6 per purchase. Take that $4-$6 per purchase and multiple it by 100 because of the search volume, and that means I could make an extra $400-$600 per month for EACH of those posts. We’ll see if the napkin math works out, but I’m excited. So excited in fact that in the month of January I created my first review for a keyword that has 260 searches per month and the average cost of the product is about $70. If I’m able to rank for this term, then I could likely expect an extra $150-$200 every month from this single article moving forward. To be honest, I do think I’ll be able to rank. My keyword research indicated it was a good term to write about and the search volume isn’t too bad. If that actually happens, this website is going to be ridiculously profitable with these review. Other than that, I do want to mention that I hired someone full-time to help me with this website as I have too many data-entry and research-oriented tasks to handle. This is someone that I’ve worked with for the last six months and she’s nothing short of incredible. She’s become my go to for all of the processes of this website and with the way that this websites going, I have no doubt that I’ll be able to keep her busy for at least the entire year. The best part is that she’s in the Philippines and is willing to work for $3.75 per hour. Now I know, some of you probably think that that’s far too little to pay somebody. But I can say with absolute confidence that this is actually a livable wage in the country. I asked her directly. The thing that I found most interesting is that she had no complaints about the pay and I confirmed that she can pay her bills and live reasonably well off of that hourly pay. Even more interesting was that she mentioned how she wanted to go to school to be a nurse in the future and told me what the average salary was on a yearly basis for that position when someone is starting. The thing that was an absolute shock to me is that I’m paying her more now than she would make as an entry-level nurse. She doesn’t know this yet, but as long as things continue to do well with the website, I’m not going to let her become a nurse and I’m just going to pay her more than most people make in the country. She’s an awesome person and does really good work, I’m very hopeful she will be around for years. 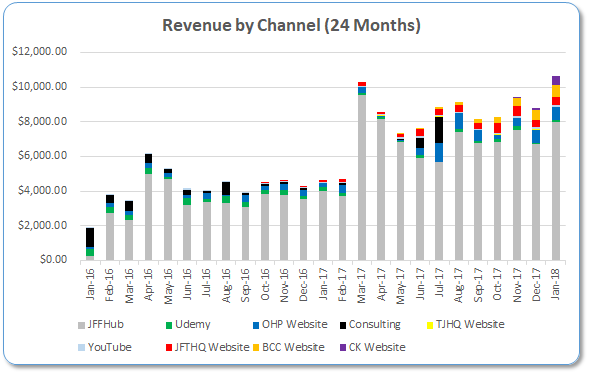 Don’t Give Up on a Penalized Website: Last month I was incredibly frustrated with the JFTHQ website and was contemplating selling it. But instead, I was patient and decided I was just going to continue to link build. While I don’t know exactly how much this website will make in the future, the fact that I had the most page views ever in the month of January is a good sign. Make Your Reviews Better Than Competitors: While I’m still not 100% sure how this is going to pan out, I strongly believe that making your reviews significantly better than your competitors is the way to make the most affiliate income. I know that everybody won’t be able to buy all of the products like my plan is, but I think that these money pages are really worth the extra effort. Focusing on a Single Project Can be Really Cool: One of the hardest things that I’ve dealt with while building my portfolio of websites is trying to concentrate on one project at a time. For such a long time I thought that I’d be to bored working on one project and just didn’t have enough focus on one project day after day. Surprising even to me, the CK website is requiring all of my time, a lot of my writer and editor’s time, and an additional full-time staff member to complete the work on it. But what I’ve found is that this is a huge positive for the site. We’re making a ton of progress and I’m actually enjoying it because there’s so many different areas that we can work on within the site itself. I was so focused on link building the last few months that I lost touch with reality and thought that building 60 links was going to be easy. This definitely isn’t easy and my goal for January was simply too high considering I had so many other things I was focusing on. That said, I was able to build 35 links to my portfolio of websites in January and that’s not too bad considering it wasn’t much of a focus. I was able to do this and it was truly a monster review and tutorial. It took me over 15 hours to complete and you can see the entire review and tutorial here. Again, I highly recommend that you watch this if you trying to make your website look pretty with custom design pages and don’t want to spend time and money on a developer. It was cool to go through this link building campaign as it made me revise an old section of the website and reach out to a lot of reentry programs that I’ve lost touch with. While I wouldn’t say this link building campaign was a smashing success as I only got six links, I am happy that I was able to build some links to the key page and I’m confident that in the coming months those efforts will be rewarded. I’m going to be a little bit more realistic this month and set a goal of hitting 40 back links to my portfolio of websites. I have a pretty passive process of trying to get links for JFTHQ and I believe that the only other website that I’ll be focusing on getting links to this month will be the CK website. There are so many keyword tools out there now, but I’m still a fan of good old Long Tail Pro. That said, it’s definitely a good time for me to sit down and write a review/tutorial about Long Tail Pro and I’m sure many of you guys would benefit from me explaining to you how I do my keyword research. So, one of my goals in January is to complete a review of the keyword research software that I’ve been using for over five years. This one is going to be difficult because it’s completely new to me, but by the end of the month I want to have the BCC calendar on Amazon fully stocked and ready for FBA. I know I’m going to do this, but as of today I have absolutely no idea how it’s going to happen. I already have the design file ready and I’m going to send that to the printer this week, but we’ll have to see how this whole Amazon FBA thing works. Definately a good beginng for new year. Noticed “guest post guidelines” is broken and serving HTTP Error 404 page. Hi Ron, congrats to these excellent results. I will definately try your tip of using the Adsense Textlinks. I ried them years ago and wa not happy as the visitors had to take two steps to make me money. My guess is that many were annoyed when they discovered that they clicked on an add-link. Regarding the calendar project I have a question: how do you handle the copyright issue? I understand that the facebook users submitted pictures to the group, but do they loose their copyright then? Are those that you include in the calendar compensated by any means? Thanks for commenting, appreciate it. Adsense textlinks definitely were counter-intuitive to me, but whatever earns more is what I care about. Definitely test it, worth a shot. I’m not sure it will work in every niche, but only one way to see. When they submitted the images there was a disclaimer saying that they were allowing us to use the images in commercial print projects. I am not compensating them and people seemed to be fine with that. The idea was that they would submit and if chosen, they get a free calendar. Worked pretty well I think, no complaints. Fabulous number and splendid start of the year. I have been following your OHP for long time and it’s been inspiration for me like many others. I love and appreciate your honesty and transparent monthly report. Here you go rowdy professor. When I pointed out area of improvements you deleted my comments and when I writing some juicy comments you are all good. I have no idea what you’re talking about with deleted comments.